This weekend! Free and cheap things to do 10/26 to 10/28 in NYC. Cultural events in art, architecture, music, film, dance, theater, design, food and general fun. This week’s listings include a smattering of spooky Halloween-related events. 1. Design/Architecture/Talks – Designers & Books Fair 2012 is a live New York City event at the intersection where design, architecture, and books meet. All weekend at FIT. Tickets range from $25 to $50. See schedule. 5. Film/Discussion – Encore screening of The Curious Incident of the Dog in the Night. Fri 10/26, 7pm. $25. 6. Theater – How to Break at Here Theater. All weekend. Check schedule for times. $10 in advance. $18 less than 24-prior. Students with ID FREE. Alternatively: Tim Burton Burlesque, Fri 10/26, 9pm to midnight at Bar Matchless. $5 in costume; $7 if not. 7. Film –Holy Motors at Walter Reade & Film Forum. All weekend. $13. 8. 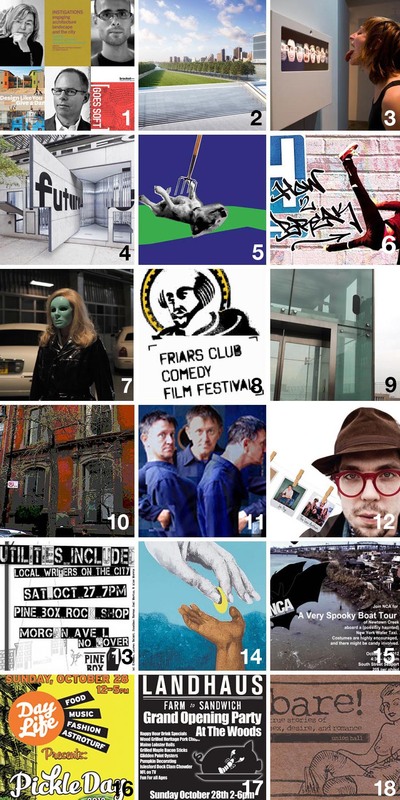 Film – Friars Club Comedy Film Festival. Fri 10/26 & Sat 10/27. See schedule for films & times. $10. 10. Walking Tour – Haunted Tours of NYC. All weekend. Nightly at 8pm. $20 Adults $15 Kids. 90-minute tour. 11. Comedy – Jos Houben: The Art of Laughter. Renowned actor from Théâtre Complicité and longtime collaborator of Peter Brook presents a hilarious comedy about comedy. Sat 10/27 at 7pm. $20 with Code FIAF20. 12. Music – Justin Townes Earle with Low Anthem and Joe Pug at Pace. Fri 10/26 & Sat 10/27. At 7:30pm. $5 for Students. $25 and up everyone else. 14. Art – One of our favorites! John Baldessari Double Play at Marian Goodman. Fri 10/26 & Sat 10/27 through 11/21. FREE. 15. Tour – A Very Spooky Boat Tour of Newtown Creek. Sat 10/27 from 4:30 to 6:30pm $20 Leaves from South Street Seaport. Alternatively – Halloween Dead Celebrity Ball: Costume Ball aboard the Jewel Yacht. Fri 10/26 at 8pm. Check back for updates and take a look at our previous Culture on the Cheap posts for ongoing suggestions. Have fun!